"When Your Horse Rears: How to Stop It"
You can’t make your horse stop rearing with a “bigger, badder bit.” You can’t “wish it away” and he’ll not magically “get over it.” You’ve got to proactively retrain his brain. Here’s how. Take the time it takes to learn and practice the supplemental material that follows. Each chapter offers added insight and greater control. Practiced together, they’ll boost your overall training to a new level - and prevent a rearing reoccurrence in the future. This is -- with super-specific detail -- how to pick up, handle, and release your reins. If your horse is given to rearing up at the touch of your reins, it is critical that you become practiced with your hands, your primary source of communication. Beyond the actual mechanics of how you pick up, handle and release your reins, here are five tips or tricks that’ll help you develop the rhythm, “feel” or timing it takes to get “110%” out of your horse each and every day. Simply put, riders with “good hands” do not have horses that rear. Discipline problems of all shapes and sizes vanish when your horse recognizes you as boss. Here’s training for a rainy day that keeps you - or puts you back - in charge. The material in this chapter was previously written to teach the beginning’s of a reining spin, the reverse-arc circle, “neck reining,” and shoulder control in general. Looking back at it, I realized how beneficial it would be for the owner of a rearing horse to gain the ability to consciously cause the horse to shift its balance from the front to back legs (as for a spin) and so it’s included here. If your horse has a cow at seemingly simple requests, he might be spoiled... or it might be that his feet are hurting him. He just might have a good excuse. Here’s how to tell. When riding, use your reins to “lead the horse from his back.” You’ll make your point faster - and thus be out of his mouth (when you drop those reins) faster. When training the recovering rearing horse, we’ll pull out every trick that helps us “go easier” on the horse’s mouth. With the tip that follows, you can train your horse about a million times faster when you look for little clues he’s already giving you - and release your reins at that moment. Does it scare the devil out of you when your horse throws himself in the air? Wanna make riding fun again? But how? How do you fix this -- when the very touch of the reins sends your horse up and over? When things escalate so fast? Start by asking yourself what you were doing seconds before your horse reared the last time. The odds are pretty good you were trying to stop or back up - and you were applying even pressure on both reins as you asked. In "When Your Horse Rears: How to Stop It" we'll train your horse to accept pressures typically associated with stopping and backing and the like. We'll learn the theory and practice allowing us to soften and relax our horse, giving us greater control over his mind and various body parts. We'll teach respect for the bit while building smooth transitions from standing to walk to trot to lope. 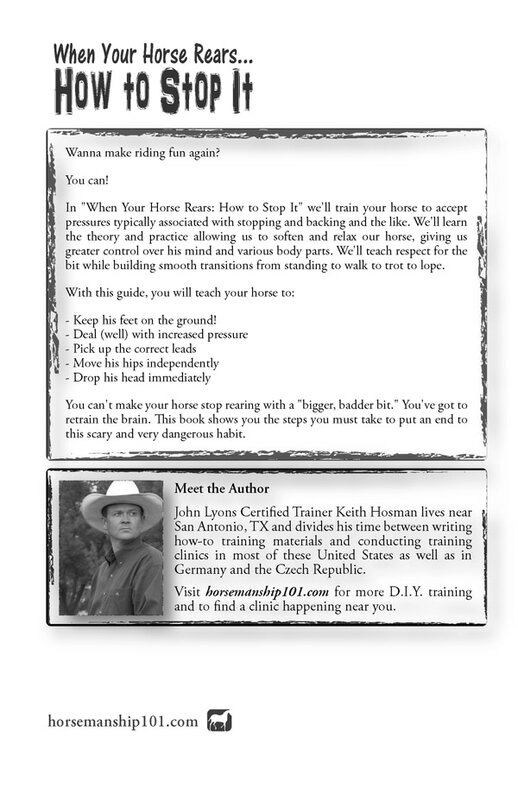 The first half of this book is a set of detailed instructions designed to fix your horse; the second half offers a way to develop and improve you the rider/trainer, your training habits and methods. In the end, you'll be able to make ordinary requests, (to "stop" or "back," for instance), without fear that your very pressure is an overt invitation to rear up. In fact, once you've put the time in, you'll be amazed at the difference made in your overall control, safety and enjoyment. Keep his feet on the ground! Cure a nightmare situation that could put you in the E.R.! This is true "Do It Yourself" training - and only you can decide if this is something you, personally, are up for. 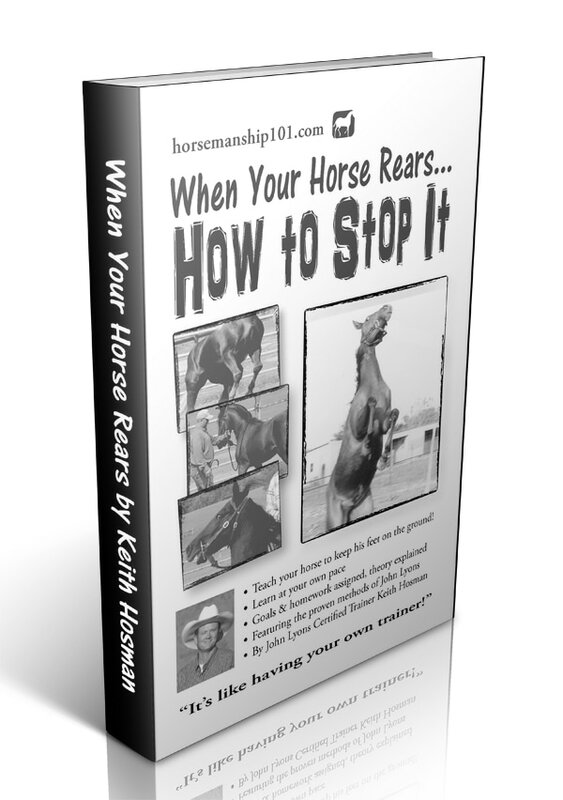 Horse training can be a dangerous activity - so if you have any doubts whatsoever in your abilities, then I suggest you purchase and read this book simply for the deeper understanding you will glean - and then hire a pro for help and guidance.